Walnuts make for a great crunchy snack, but did you know that they offer some surprising health benefits? Although walnuts are high in fat, they have long been considered to be beneficial for both heart and brain health due to the specific type of fat they contain. You may be thinking that fat can’t be good for you, but not all fats are created equal! While there are unhealthy types of fats that should be avoided—including trans fat and saturated fat—there are also healthy fats that your body needs, called polyunsaturated and monounsaturated fats. Walnuts are high in polyunsaturated fats, which chemically means that the fat molecules have more than one unsaturated carbon bond in the molecule, also called a double bond. Polyunsaturated fats can help reduce LDL cholesterol (“bad” cholesterol) levels in your blood, which can lower your risk of heart disease and stroke. Polyunsaturated fats also are high in omega-6 and omega-3 fatty acids. These are essential fatty acids that the body needs for brain function and cell growth. 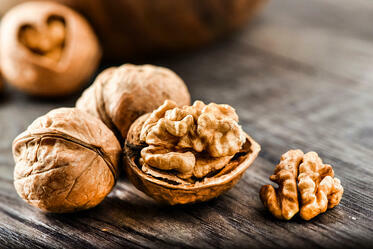 Our bodies do not produce essential fatty acids, so it’s important to get them from food sources, such as walnuts. Even though walnuts are good for your heart and contain a healthy type of fat, they are still high in calories, so it’s important to stick to the recommended serving size. One serving of walnuts is about the size of a golf ball, or the amount you can fit in small handful—1.5 ounces. But luckily, there are many great ways that you can incorporate a serving of walnuts into your diet. For any of the options below you can use raw walnuts or try toasting them to enhance the flavor. Simply bake the walnuts in a 350°F oven for 5-10 minutes or until golden brown. Top a salad with chopped nuts instead of bacon bits and croutons. Sprinkle walnuts on top of yogurt, sliced fruit, or hot or cold cereal. Bring pasta to life by sprinkling it with chopped walnuts. Add walnuts to bread, pancakes, waffles, or muffins when baking. Add walnuts to popcorn for a tasty, savory snack. Add great flavor to steamed veggies with a handful of chopped nuts. While walnuts are a great choice to add to your diet and offer many health benefits, they are not a cure-all. Remember that there is no single food in your diet makes your healthy. The only way to achieve true health is through a combination of healthy diet, regular exercise, and quality sleep.